My sweet daddy had hernia surgery yesterday. I'm still slightly unclear about what a hernia actually is. I mean, I think I know that it has something to do with some of your parts poking through other parts of your parts and it's uncomfortable. I'm okay with being vague. All is well, thank goodness, but any surgery is still surgery and there's usually lots of anxiety and waiting and prayer and pain along with good drugs, possible nausea, and then recovery. He had met his deductible for the year (apparently this is a thing) (thankfully I don't know much about meeting deductibles due to doctor visits, tests and so forth) and decided to go ahead and get his hernia situation taken care of. It was supposed to be outpatient/day surgery with a probable overnight stay (I'm not sure how you classify that). Some doctors do hernia surgery laparoscopically but his must be more old-school so he's got a good ol' incision going on and will most likely stay in the hospital until Wednesday. After taking Annelise to school and getting myself together, I ventured toward the Houston Medical Center, about 40ish minutes away under ideal conditions. As I was approaching Methodist Hospital I got a call from the school nurse saying that Annelise wasn't feeling well. No fever but headache slash vague stomachache slash I really don't feel like being at school today thing. Thankfully Scott said he could pick her up and work from home so I could be at the hospital. I got to see my dad for a while before they took him back, so that was good. Two couples from their camping group were also there to keep Peggy company while she waited which was sweet. You wouldn't think waiting would be hard but it can be. I was all prepared with a new book to read headphones and snacks (coffee, apple and cheese) but I mostly just sat there and listened to them tell stories. I really had wanted to start my new book but thought it would be rude to get it out. Hashtag introvert problems. The room was full of people waiting for news about their persons and I kept wondering what their stories were. I'm nosy that way. 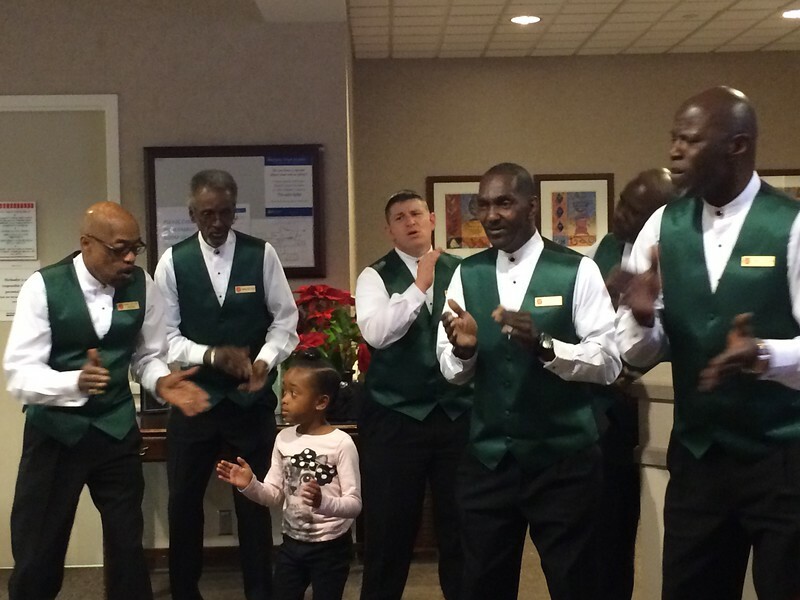 This group of singers came up to brighten things up a a bit with some Christmas carols. They were accompanied by this darling little five year old. She was a hoot! Sidenote: I really like Methodist Hospital. I mean, I don't know personally, just as a visitor, but from my dad's experiences and I'm really impressed. Everyone is so helpful, polite and friendly. Plus, you know, good at their jobs. It's like the Chick-Fil-A of hospitals. We got to see my dad in recovery for a minute and then later up in his room. He was mostly snoozing, which was good. I left around 4:00 to try and beat the monster known as Houston traffic--and all things considered, (including missing my intended turn and taking Loop 610 home instead of the Beltway, oh well) it wasn't too bad. Listening to my Merry& Bright playlist on Spotify helped bunches (played on shuffle). I may have even repeated it three or four times in a row. Whatever gets you through the crazy Houston freeways, man.